Mohamed joined Eldib back in 2007, where he, while working, acquired his first Master’s degree from IUPUI majoring in International Comparative Commercial Law. Later in 2011, Mohamed travelled to the UK, London, to join QMUL for his second Master’s degree majoring in International Comparative Competition Law. Mohamed re-joined Eldib in September 2012. His long years of experience along with his different educational exposures provided him with a legal knowledge that smoothly covers all legal requirements, in different aspects of law, from different jurisdictions the world. 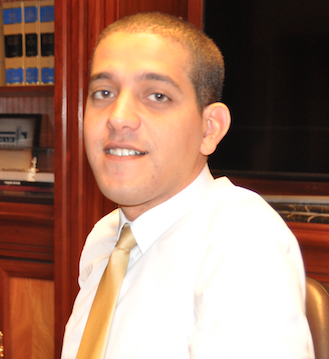 Mohamed joined the Banking as well as Corporate departments in Eldib where he specialized in rendering full legal consultancy to national and international corporates as well as few multi-national banks in Egypt. He successfully negotiated and drafted agreements concerning but not limited to; Franchising agreements, Transfer of Know-How agreements, Confidentiality agreements, Petroleum and petroleum services agreements, Employment agreements, Bank – Costumer rescheduling agreements, Joint-Venture agreements, Loan & lease agreements, and supply agreements. He also leaded handful cases of Mergers and acquisitions as well as conducting several due diligences for different national and multi-national corporates working in different fields. He is also holding the accounts of three major multinational Freight Forwarders corporates nationally and internationally. Mohamed, besides being comfortably familiar with ADR, is also handling several arbitration cases before Cairo Regional Centre for International Commercial Arbitration as well as the International Arbitration Centre. Mohamed is also capable of litigating before Commercial (including Maritime Law), Civil, Misdemeanours, Administrative, Family Affairs and Economic Courts (First Instance and Appeal). LL.B. Alexandria University, English department, Egypt. LL.M. Queen Mary University of London, United Kingdom. LL.M. Indiana University Purdue University, United States of America.